With publication of the results of the second of the "Original 3" NuSI funded studies, I'm finally getting around to publishing up this post (and perhaps a second one shortly) regarding the Nutrition Science Initiative (NuSI), founded in 2012 by Peter Attia, MD and "science journalist" Gary Taubes. Bottom line ... for NuSI, it was "all over but the crying" a couple of years ago now. The founding of this "non-profit" was met with much pomp and circumstance, and cheerleading along the way, some of which (likely repeats of previously blogged on material!) I've included at the end of this post. Maximizing the proportion of the available funding applied to "direct costs" (not exactly what happened with the real MP, but it's the popular interpretation). NuSI funded three studies from the roughy $40 million initial grant commitment from the Laura and John Arnold Foundation. 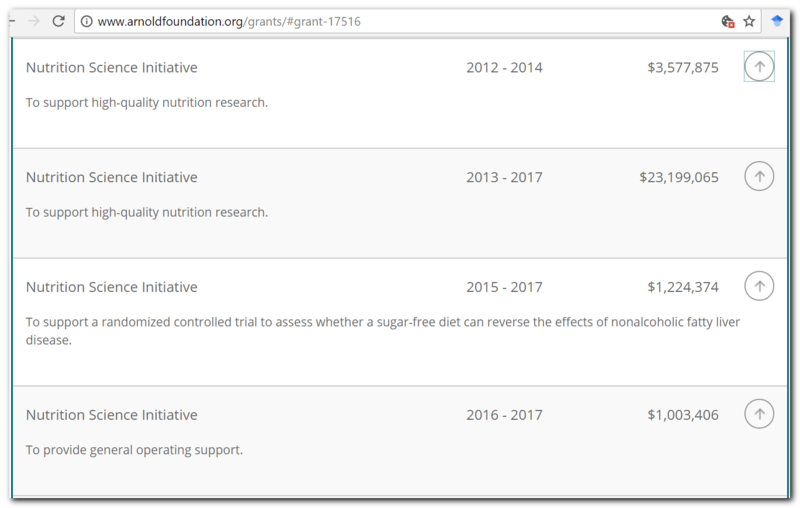 As it turns out, each of these studies had other funding sources, and in the case of #2 expanded a study already underway. There was nothing novel about #3 as the study design is very similar to a 2012 published study by the same research group. Sometime in mid-to-late 2013, NuSI's "work" there, aside from communicating the results to the public, was done. These were to be initial studies, just the start. In 2014, we were told the start of something hopefully much bigger -- almost $200 million dollars bigger. This never materialized. It is important to remember that NuSI was supposed to be nothing more than a facilitator -- a middle-man between LJAF and researchers. NuSI's role was to gather the great minds "under one virtual roof". They were not supposed to be involved in any aspect of the actual research. (... remember, NuSI doesn’t do the experiments, NuSI funds and facilitates the teams who do the experiments. Desig studies, procure appropriate clearances (e.g. IRB) and registrations (e.g. ClinicalTrials.gov), recruit, screen, compensate, etc. any subjects, etc. Payroll any researchers, techs or contract outside labs, etc. Much hullabaloo was made over Peter Attia setting up an office in San Diego. NuSI was going to change the world. But the fact remains that whatever "work" there was to be done by NuSI in the initial three studies, it was mostly done in calendar year 2013. As 2016 got underway, we learned that without ANY fanfare or formal announcement, founder and President Peter Attia had exited NuSI in December of 2015. 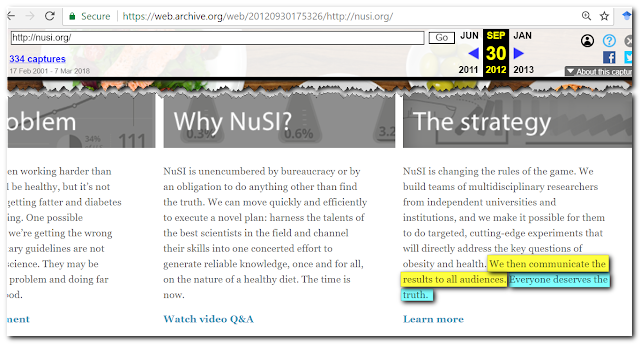 There was NO mention of this monumental change in the organization on the NuSI website, nor has there been since. "We then communicate the results to all audiences. 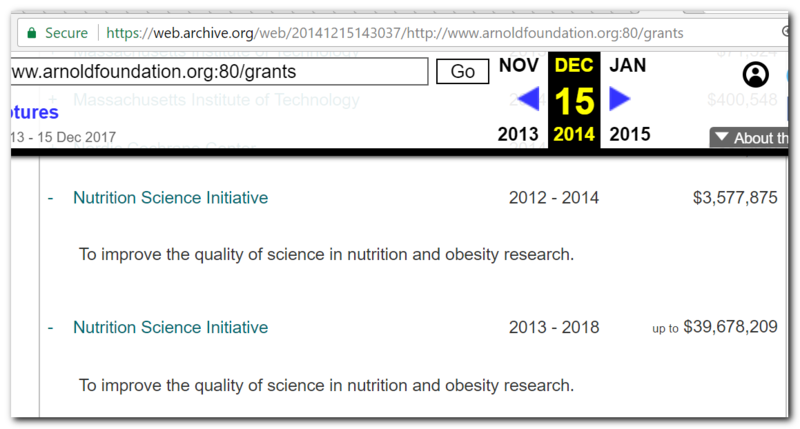 Original funding on left, current itemization on right. Click images to enlarge. In the process of writing up my own response to the results of that Gardner-led study, I exhumed this current post from the early 2017 draft pile. In heading over to Guidestar.org for links to the original IRS Non-Profit Form 990s I noticed that NuSI had filed for 2016 in my absence. So I updated the spreadsheet that I had compiled a year ago to include this tax year. In going through this again, I must admit that it makes me sick to my stomach. NuSI embodies just about everything that is wrong with the concept of the 501(c)3 "Non-Profit". 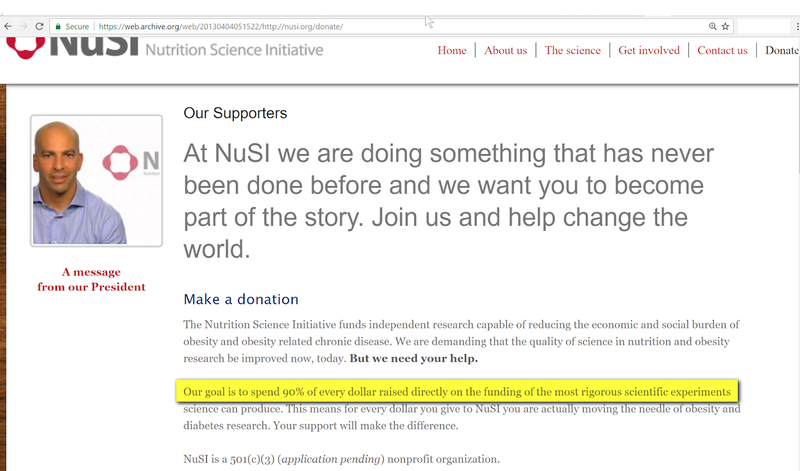 Sure, as an organization, NuSI "corporation" did not profit. But there was rampant personal enrichment associated with this endeavor. This under a cloak of public accountability via releasing Form 990s, where there is seemingly no accountability for the actual allocation of funds. Essentially NuSI took money from LJAF and doled it out to a few research facilities and technology companies to fund a total of 4 studies. At the end of 2016, they have a spare million-&-a-half-or-so lying around what Gary Taubes has described as an organization basically limping along into obscurity as a largely volunteer operation! All non-profits are required to make their income tax filings available to the public. Organizations such as Guidestar.org make these available to the public on their website. Currently only the most recent three filings are available at this site, but the full record is available (and I among many have saved them). 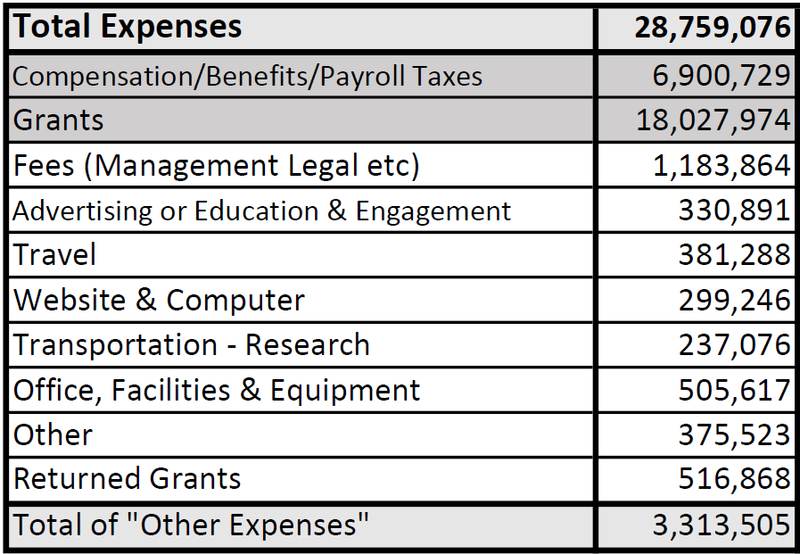 I summarized the Form 990 data from years 2012 through 2016 and totalled things up for both Attia's tenure (through 2015) and the full five years for which records are currently available. 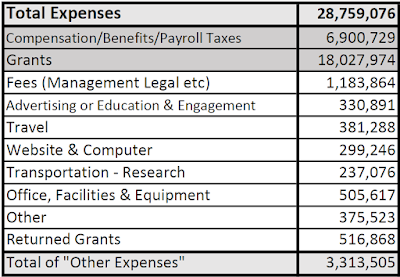 Additionally each expense on the Form 990 is separately allocated to one of three categories: Program Services, Management & General, and Fundraising, so I have this totalled up as well. Think about this! In 2012-13, the LJAF had already committed to "up to $39.7 million" on top of a 3.6 million dollar seed grant. Of the funds obtained and spent in the operation of NuSI, a "Manhattan Project's-worth" of 10% was spent in a spectacularly FAILED attempt to raise additional funds. Almost a full 25% went into compensation and personnel related expenses to staff this endeavor. Let's look a little more closely at that, shall we? Forget percentages for just one moment. NuSI spent close to 7 MILLION DOLLARS to staff a non-profit that did virtually nothing in-and-of itself! This is something that no for-profit entity could ever justify to shareholders! Now let's focus on a few of the main players, starting with Peter Attia, MD. Peter Attia was paid a 4-year total of 1.7 million dollars. He claimed the following hours/week (not shown) on the Form 990: 2012: 40 hr/wk, 2013: 75 hr/wk, 2014 & 2015: 60 hr/wk. 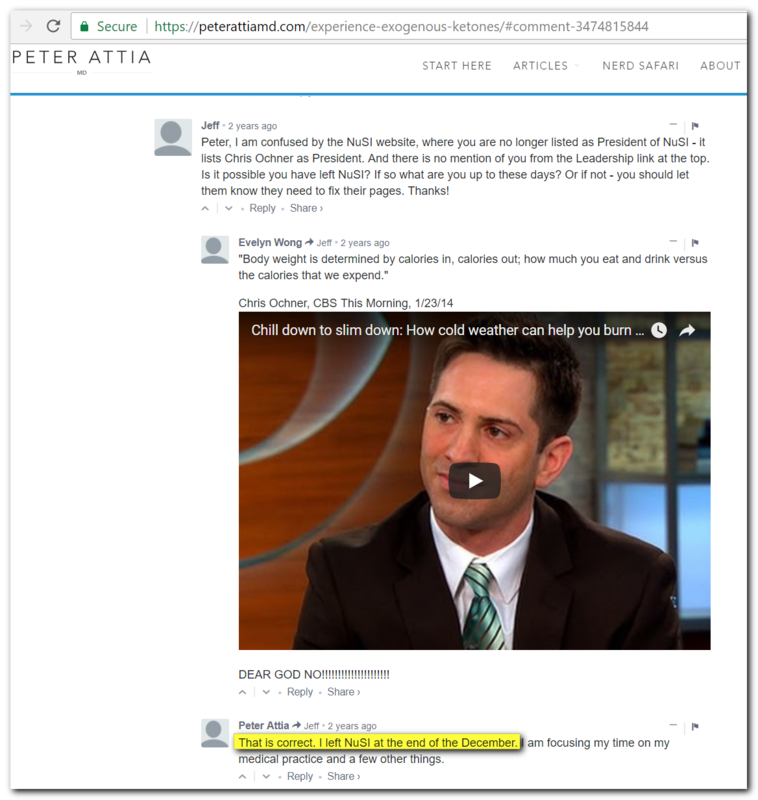 Even if Attia did every last bit of work for NuSI, and affording a very generous 6 weeks/year vacation, this US taxpayer has to ask: What did Peter Attia do for the almost 10,000 hours this would amount to????? 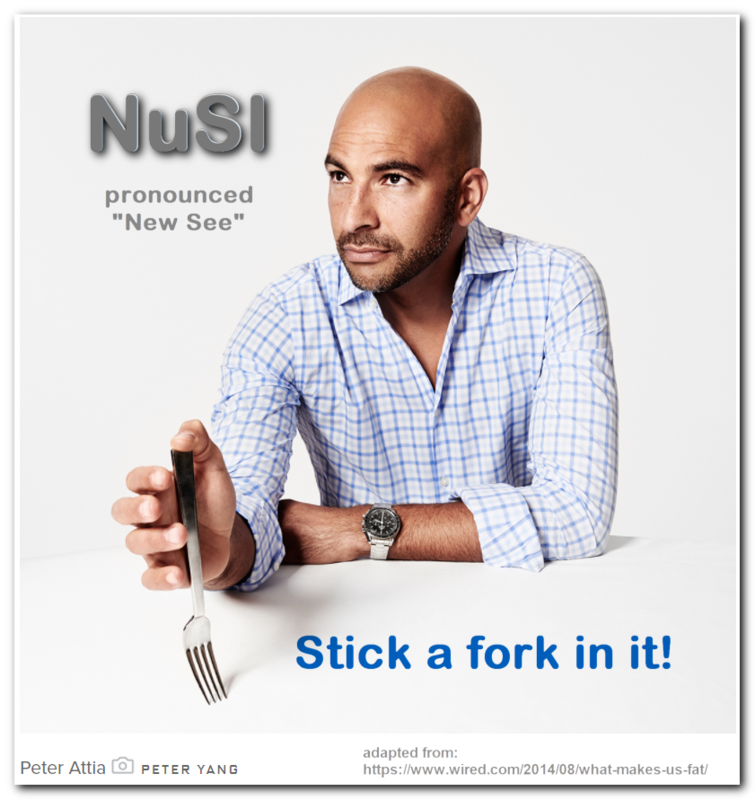 NuSI–has been called the “Manhattan Project of nutrition.” They are run like a lean startup, and I’m proud to be a part of their advisory board. Attia supposedly scaled back hours from a credulity-challenging 75 per week in 2013, to a still-highly-suspect 60 per week. He exited NuSI receiving (some might say "made off with") almost three-quarters of a million dollars in that last year! Attia's $727K 2015 salary was more than twice that of the (or any) previous year! And then there's his partner in crime, Gary Taubes. What did Gary Taubes do for the over 8,000 hours he claims to have logged over 5 years (40 hrs/wk each year) ? Taubes was compensated $586K over 5 years. This REALLY puts Attia's last year's take in perspective! Between the two founders, the pair profited personally to the tune of almost $2.3 Million. Grants from NuSI for scientific research totaled $18,027,974. Compensation for Co-founder & Presidents alone totalled 12% of the total of these salaries and grants made. What exactly did Stacie Spector do for 40 hrs/wk in 2013 & 15, and 50 hrs/wk in 2014 as VP of Strategy? Does it justify over one-half million dollars in compensation? What did (long-time friend of Taubes) Mark Friedman do as Director of Research, (hired mid-2014!) do to justify almost one-half million dollars in compensation? Between these two right there, you have funding for that NAFLD study. What "Operations" did Lacey Stenson direct from 2013-2015 to justify over $400K in compensation? What "Development" occurred in 2014 to justify over one-quarter million in compensation for Kira Baccari? She supposedly put in 50 hours per week. Really? Doing what exactly?? Spector, Stenson & Baccari put in 50 hours per week, Friedman 40, Taubes 40, and Attia an unfathomable 60 hours per week. Were they still trying to save the ship in 2015? Attia at 60, Stenson at 50, and Taubes, Spector, Friedman & Eckstrand at 40 hrs per week, totalling $1.5 million?!!?!! But WAIT! There's MORE!!! Another 3.3 Million on "Other Expenses" over the 5 years. Energy Balance Consortium $5 million: Instead of a "pilot" study, the scope and duration of this study could have been significantly expanded by tripling of funding! Stanford University Study $7.4 million: Imagine what more than doubling the funding could have done here. Boston Children's Hospital Study $13.6 million: Imagine what an additional $10 million could have done to iron out all the kinks from Ebbeling et.al. 2012! ... and we could have NAFLD in children, at least, pretty well cured by now, right?? Following Peter Attia slipping out the back door at the end of 2015, NuSI inexplicably rolled out a totally revamped website for 2016. I'm not sure quite why this was needed, there has been nothing new added since early-to-mid 2015. There's been total social media (and any traditional media for that matter) silence from NuSI. As of now (March 2018), the results of the first two studies have been published. The Hall-led Energy Balance Consortium was completed by Summer 2014, and (finally) published in July 2016. Gary Taubes responded disgracefully to the results as they were not favorable to his pet hypothesis. Instead he chose the low road, impugning the integrity of researchers he had previously touted and eventually having to apologize to Kevin Hall for his behavior. In the end, this metabolic ward study added to considerable pre-existing evidence of similar quality that falsified TWICHOO. The Gardner-led Stanford results were just published last month. Despite spin by Taubes and Ludwig (the conflict of interest there as a NuSI funded researcher is staggering!!) the results were unfavorable to TWICHOO. Make no mistake about it, the design of this study had foremost in mind this idea that a person's "insulin status" was an important component in dietary recommendations to either prevent weight gain/obesity and/or predict success in weight loss/reversing obesity. The answer was a rather resounding "no evidence to support" ... and the spin is rather more than embarrassing at this point. Ludwig's study has morphed into the Framingham State Food Study, and by most indications ended sometime last year. There had been no further mention of NuSI in the later "recruiting classes" for that study. In the end, the weight loss phase of that study will, once again, confirm that a calorie deficit is the key, and all subjects will have lost weight on a "standard" low fat reduced calorie diet. I predict Ludwig will do his best to spin in the actual journal article, but there will be nothing earth shattering to come from this study. 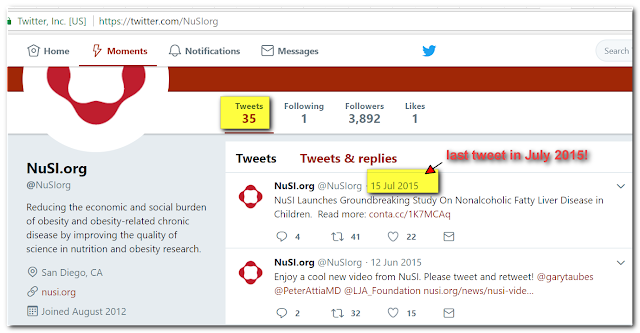 Eventually we'll get the results of the small NAFLD study, and that will be the end of NuSI. But we won't even be hearing it from them. Edit 3/13/18 to add this screencapped quote from NuSI. This was tweeted to me by the author of the following blog post written about Low Carb Fraud last November. 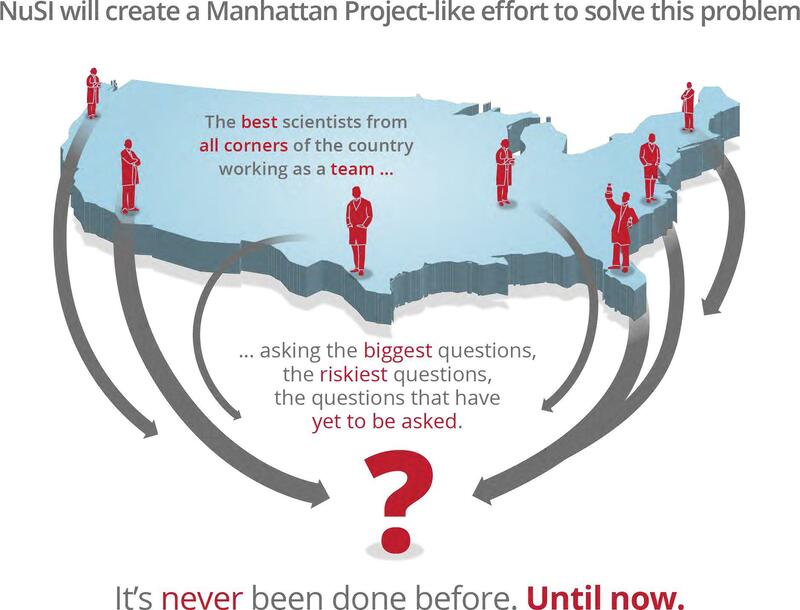 ...] Today, the Laura and John Arnold Foundation is bankrolling a $26 million nutrition study by Attia's nonprofit, an effort that involves the use of metabolic chambers and that Attia likes to call "the Manhattan Project of obesity." The Energy Balance Consortium Study, as it's called, is one of the first to be backed by the Nutrition Science Initiative, a nonprofit that prides itself on funding fanatically careful tests of previously overlooked hypotheses. The three NuSI studies now under way, which focus on establishing the root causes of obesity and its related diseases, provide just a glimpse of Taubes and Attia's sweeping ambition. 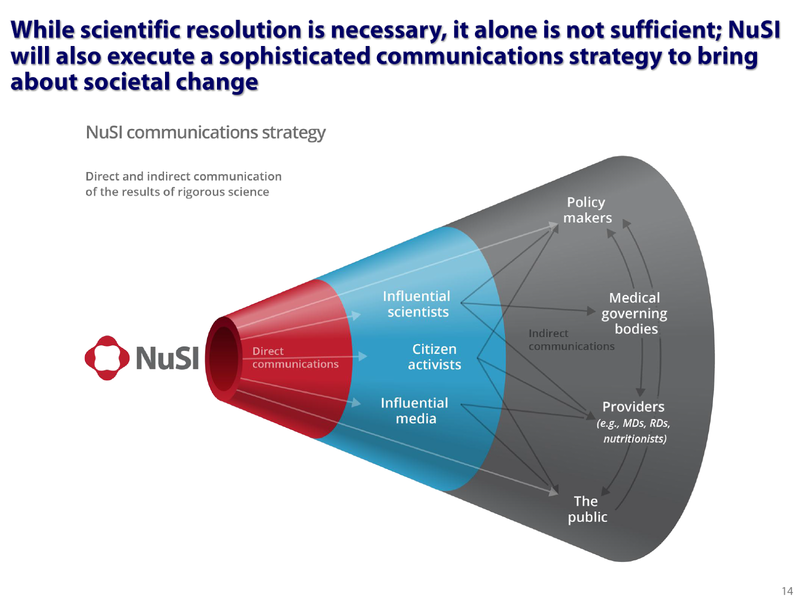 NuSI has already raised more than $40 million in pledges and is in the midst of a $190 million, three-year campaign to fund a new round of studies that will build off the findings in the initial research. THE INITIATIVE HAS AN AMBITIOUS GOAL: CUT THE PREVALENCE OF OBESITY IN THE U.S. BY MORE THAN HALF IN LESS THAN 15 YEARS.